The wooden wheel first used as a means of transportation around 5,500 years ago in what is now the Middle East, and the news spread fast in neighboring regions. In Sumerian times, wild donkeys hauled chariots, while oxen and mules were used for heavy loads. By about 900bc, the time of the Assyrian Empire, spoked wheels had replaced the earlier wheels made from a single piece of solid wood. Roads varied in quality through the Assyrian Empire. Local paths were little more than tracks, but there were good roads between the main towns. These were well maintained so that messengers and state officials could reach their destination quickly. The Assyrians also perfected the art of chariot warfare, which gave them a big advantage over enemies who were fighting on foot. They could attack their enemies from above, and were able to move around the battlefield quickly. Thick card, compass, ruler, pencil, scissors, pen, masking tape, newspaper, two card tubes, flour and water, cream and brown acrylic paints, paintbrush, water pot, two pieces of dowel measuring 6 ¼in long, needle, four toothpicks. Measure and cut out four card circles, each one measuring 2 ¾in in diameter. Carefully use the scissors to make a hole in the center of each circle. Enlarge the holes with a pen. Cut two sides for the chariot, 4½in long and 3in wide as shown, one back 3½in x 3in, one front 6 x 3½in, one top 3½in x 2¾in and one base 4½ x 3½in. Trim the top of the front to two curves as shown above. Stick the side pieces to the front and back using masking tape. Then stick on the base and the top of the chariot. 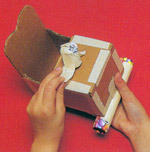 Roll up a piece of old newspaper to make a cylinder shape about 1in long and tape it to the chariot as shown above. Attach the card tubes to the bottom of the chariot. Mix a paste of flour and water. Dip newspaper strips into the paste to make papier-mâché. Cover the chariot with layers of papier-mâché until the card underneath is hidden. Let it all dry. Paint the chariot. Use a needle to make a hole at each end of a piece of dowel. Insert a toothpick, add a wheel and insert into tube. Secure another wheel at the other end. Repeat. 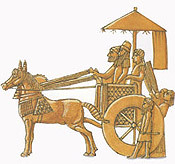 The solid-wheeled chariot you have made is based on a very early chariot design made in northern Mesopotamia around 4000 years ago. When the spoked wheel replaced the solid wheel, chariots became lighter, faster and easier to steer.